In this concluding chapter, we revisit the beginnings of our book and discuss the main findings of our project. The case studies presented herein are a unique combination of wide-ranging data from different sources, the innovative use of computational and qualitative methods and ambitious theoretical cross-pollination. This multifaceted approach has allowed us to address the hybrid logics of the circulation of meanings and emotions in the contemporary media environment over time. Moreover, our enquiries have made visible how mediated communication and affect are used by societies to maintain the status quo after traumatic, disruptive events. The findings provide new insight into disruptive events in the global hybrid media environment and into the way they are influenced by the factors of time, space and emotion. Ide, A. (2014, January 1–2). The situation of dark tourism in Japan and Fukushima Daiichi nuclear power station. Paper presented at international conference on humanities, literature and economics (ICHLE’14), Bangkok, Thailand. https://www.icehm.org/proceedingspdf.php?id=4. Accessed 4 Oct 2018. Nuclear Regulation Authority, Japan. (2016). Estimated and measured 1m height environmental radioactivity level at monitoring posts in 47 prefectures (Monitoring date: June 2, 2016). http://radioactivity.nsr.go.jp/en/contents/12000/11149/24/192_20160602_20160603.pdf. Accessed 4 Oct 2018. Nuclear Regulation Authority, Japan. (2018). Estimated and measured 1m height environmental radioactivity level at monitoring posts in 47 prefectures (Monitoring date: September 30, 2018). http://radioactivity.nsr.go.jp/en/contents/14000/13015/24/192_20180930_20181002.pdf. Accessed 4 Oct 2018. Rantasila, A., Sirola, A., Kekkonen, A., Valaskivi, K., & Kunelius, R. (2018). 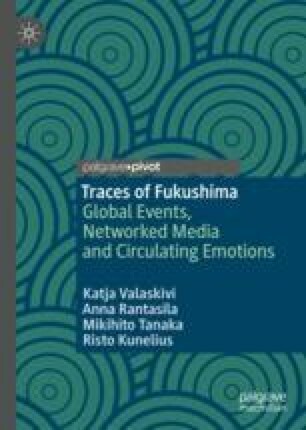 #fukushima five years on: A multimethod analysis of Twitter on the anniversary of the nuclear disaster. International Journal of Communication, 12, 928–949. https://doi.org/1932-8036/2010005. UNSCEAR (United Nations Scientific Committee on the Effects of Atomic Radiation). (2018). What levels of radiation exposure do people receive? United Nations. http://www.unscear.org/unscear/en/faq.html#Levels%20of%20radiation. Accessed 4 Oct 2018.